Advancing therapeutic discoveries through early clinical studies benefits from a working knowledge of regulatory history, practices, provisions, procedures and controversies. This chapter aims to supplement available published and web-based resources that describe current regulatory expectations and requirements. Though the Food and Drug Administration (FDA) is emphasized for illustrative purposes, the importance of the European Medicines Agency (EMA) and other regional authorities should not be minimized. Some relevant differences between EMA and FDA are also discussed. With emphasis on early studies, selected regulatory considerations are presented for developing diabetes, anti-obesity and lipid-lowering therapies towards existing therapeutic indications. Regulatory and clinical trial considerations are provided for developing novel therapeutic indications including those for nonalcoholic steatohepatitis (NASH) and related disorders. The authors thank Charles Alexander, Frances Mielach, Asoke Mukherjee, Lynn Schaich, Thomas Seoh, and Knut Zellerhoff for helpful suggestions and Brandon Jones for editorial assistance. To amend the Federal Food, Drug, and Cosmetic Act of June 25, 1938, as amended, by providing for the certification of batches of drugs composed wholly or partly of insulin, and for other purposes. 55 STAT. 77TH CONG., IST SESS.-CH. 613-DEC. 22, 1941. https://www.loc.gov/law/help/statutes-at-large/77th-congress/session-1/c77s1ch613.pdf. The FDA Modernization Act of 1997. https://www.fda.gov/RegulatoryInformation/Laws Enforced by FDA/Significant Amendments to the FDCAct/FDAMA/ucm089179.htm. The road to the biotech revolution – highlights of 100 years of biologics regulation. Linda Bren FDA Consumer magazine, Centennial Edition (Jan.–Feb. 2006). https://www.fda.gov/downloads/AboutFDA/WhatWeDo/History/ProductRegulation/UCM593490.pdf. Products. https://www.fda.gov/Drugs/Development Approval Process/How Drugs areDeveloped and Approved/ApprovalApplications/TherapeuticBiologicApplications/Biosimilars/ucm580419.htm. Accessed 5 Apr 2018. Implementation of the “Deemed to be a License” Provision of the Biologics Price Competition and Innovation Act of 2009 Guidance for Industry, Transition Period for Certain Biological Products, p. 4. https://www.fda.gov/downloads/Drugs/GuidanceComplianceRegulatoryInformation/Guidances/UCM490264.pdf. Accessed 5 Apr 2018. Milestones in U.S. Food and Drug Law History. http://www.fda.gov/AboutFDA/WhatWeDo/History/Milestones/ucm128305.htm Accessed 12 Jan 2014. Human medicines: regulatory information. http://www.ema.europa.eu/ema/index.jsp?curl=pages/regulation/landing/human_medicines_regulatory.jsp&mid=WC0b01ac058001ff89. Accessed 12 Jan 2014. ICH Topic E6 (R1) Guideline for Good Clinical Practice. http://www.ema.europa.eu/docs/en_GB/document_library/Scientific_guideline/2009/09/WC500002874.pdf. Accessed 19 Sept 2014. Human Drug Advisory Committees. https://www.fda.gov/AdvisoryCommittees/CommitteesMeetingMaterials/Drugs/default.htm. Accessed 18 May 2014. Roy ASA. Stifling new cures: the true cost of lengthy clinical drug trials. http://www.manhattan-institute.org/html/fda_05.htm. Accessed 20 Jan 2014. ICH History. http://www.ich.org/about/history.html. Accessed 31 Jan 2014. Providing regulatory submissions in electronic format — certain human pharmaceutical product applications and related submissions using the eCTD specifications guidance for industry, April 2017. https://www.fda.gov/downloads/drugs/guidancecomplianceregulatoryinformation/guidances/ucm333969.pdf. Accessed 4 Apr 2018. FDA guidance providing regulatory submissions in electronic format — standardized study data. December 2014. https://www.fda.gov/downloads/drugs/guidances/ucm292334.pdf. Accessed 4 Apr 2018. Division of Metabolism and Endocrinology Products (DMEP). https://www.fda.gov/AboutFDA/CentersOffices/Office ofMedicalProductsandTobacco/CDER/ucm269646.htm. Accessed 5 Apr 2018. Office of Drug Evaluation I – Division of Cardiovascular and Renal Products (DCaRP). https://www.fda.gov/AboutFDA/CentersOffices/OfficeofMedicalProductsandTobacco/CDER/ucm290673.htm. Accessed 5 Apr 2018. Chalk C, Benstead TJ, Moore F. Aldose reductase inhibitors for the treatment of diabetic polyneuropathy. Cochrane Database Syst Rev. 2007, Issue 4. Art. No. : CD004572. https://doi.org/10.1002/14651858.CD004572.pub2. http://www.fda.gov/downloads/Drugs/GuidanceComplianceRegulatoryInformation/Guidances/UCM071624.pdf. Accessed 20 May 2014. Endocrinologic and Metabolic Drugs Advisory Committee. https://www.fda.gov/Advisory Committees/Committees MeetingMaterials/Drugs/Endocrinologic and MetabolicDrugsAdvisoryCommittee/default.htm. Accessed 5 Apr 2018. Guidance for industry diabetes mellitus — evaluating cardiovascular risk in new antidiabetic therapies to treat type 2 diabetes. http://www.fda.gov/downloads/Drugs/GuidanceComplianceRegulatoryInformation/Guidances/UCM071627.pdf. Accessed 20 May 2014. Alldredge BK, Corelli RL, Ernst ME, Guglielmo BJ, Jacobson PA, Kradjan WA, Williams BR. Koda-Kimble & Young’s applied therapeutics: the clinical use of drugs. Published 10th edition Lippincott Williams & Wilkins; 2012. p. 252–67. http://www.astrazeneca.com/Media/Press-releases/Article/2014056%2D%2Dus-fda-approves-epanova-for-the-treatment-adults-severe-hypertriglyceridaemia. Accessed 5 June 2014. Toklu B, et al. Current indications, cost, and clinical use of Anti-PCSK9 monoclonal antibodies. Am Coll Cardiol. 2016. http://www.acc.org/latest-in-cardiology/articles/2016/05/18/14/34/current-indications-cost-and-clinical-use-of-anti-pcsk9-monoclonal-antibodies. Robinson J, et al. Efficacy and safety of alirocumab in reducing lipids and cardiovascular events. N Engl J Med. 2015;372:1489–99. http://www.nejm.org/doi/full/10.1056/NEJMoa1501031; Sabatine M, et al. Evolocumab and clinical outcomes in patients with cardiovascular disease. N Engl J Med. 2017;376:1713–22. http://www.nejm.org/doi/full/10.1056/NEJMoa1615664. http://www.fda.gov/AboutFDA/Transparency/Basics/ucm194879.htm. Accessed 10 June 2014. Office of Combination Products. https://www.fda.gov/AboutFDA/CentersOffices/Office of MedicalProductsandTobacco/OfficeofScienceandHealthCoordination/ucm2018184.htm. Frequently asked questions about combination products. https://www.fda.gov/CombinationProducts/AboutCombinationProducts/ucm101496.htm. Accessed 5 Apr 2018.
http://www.fda.gov/Food/GuidanceRegulation/GuidanceDocumentsRegulatoryInformation/MedicalFoods/default.htm. Accessed 31 Jan 2014.
http://www.fda.gov/Food/GuidanceRegulation/GuidanceDocumentsRegulatoryInformation/MedicalFoods/ucm054048.htm. Accessed 31 Jan 2014. Key Legal concepts: interstate commerce, adulterated, and misbranded. https://www.fda.gov/Cosmetics/GuidanceRegulation/LawsRegulations/ucm074248.htm. Accessed 5 Apr 2018. Investigational New Drug (IND) application. https://www.fda.gov/drugs/developmentapprovalprocess/howdrugsaredevelopedandapproved/approvalapplications/investigationalnewdrugindapplication/default.htm. Accessed 5 Apr 2018. FAQs about investigational device exemption. https://www.fda.gov/MedicalDevices/Device RegulationandGuidance/HowtoMarketYourDevice/InvestigationalDeviceExemptionIDE/ucm051480.htm. Accessed 5 Apr 2018. Guidance for industry: formal meetings between the FDA and sponsors or applicants of PDUFA products. https://www.fda.gov/downloads/Drugs/GuidanceComplianceRegulatoryInformation/Guidances/UCM590547.pdf. Accessed 5 Apr 2018. Guidance for review staff and industry good review management principles and practices for PDUFA products. https://www.fda.gov/downloads/Drugs/.../Guidances/ucm079748.pdf. Accessed 5 Apr 2018.
http://www.fda.gov/downloads/Drugs/GuidanceCompliance RegulatoryInformation/Guidances/UCM153222.pdf retrieved January 2014. Office of Drug Evaluation I – Division of Psychiatry Products (DPP). https://www.fda.gov/AboutFDA/CentersOffices/Officeof MedicalProductsandTobacco/CDER/ucm290676.htm. Accessed 5 Apr 2018. Guidance for industry, investigators, and reviewers exploratory IND studies. https://www.fda.gov/downloads/drugs/guidancecomplianceregulatoryinformation/guidances/ucm078933.pdf. Accessed 5 Apr 2018. FDA guidance for clinical investigators, sponsors, and IRBs – Investigational New Drug Applications (INDs) — determining whether human research studies can be conducted without an IND (Sept. 2013). http://www.fda.gov/downloads/drugs/guidancecomplianceregulatoryinformation/guidances/ucm229175.pdf. FDA guidance for industry – content and format of Investigational New Drug Applications (INDs) for phase 1 studies of drugs, including well characterized, therapeutic, biotechnology-derived products (Nov. 1995). http://www.fda.gov/downloads/Drugs/GuidanceComplianceRegulatoryInformation/Guidances/UCM074980.pdf. FDA guidance for industry S7B nonclinical evaluation of the potential for delayed ventricular repolarization (QT interval prolongation) by Human Pharmaceuticals. https://www.fda.gov/downloads/Drugs/GuidanceComplianceRegulatoryInformation/Guidances/ucm074963.pdf. Accessed 5 Apr 2018. Federal policy for the protection of human subjects (‘common rule’). https://www.hhs.gov/ohrp/regulations-and-policy/regulations/common-rule/index.html. Accessed 5 Apr 2018. Safety assessment for IND safety reporting guidance for industry. https://www.fda.gov/downloads/drugs/guidancecomplianceregulatoryinformation/guidances/ucm477584.pdf. Accessed 5 Apr 2018. FDA CFR – Code of Federal Regulations Title 21 (Apr. 2017). http://www.accessdata.fda.gov/scripts/cdrh/cfdocs/cfcfr/CFRSearch.cfm?CFRPart=56. Manual of policies and procedures center for drug evaluation and research. https://www.fda.gov/downloads/AboutFDA/ReportsManualsForms/StaffPoliciesandProcedures/ucm082024.pdf. Accessed 4 Apr 2018. Designating an orphan product: drugs and biological products. https://www.fda.gov/ForIndustry/DevelopingProductsforRareDiseasesConditions/HowtoapplyforOrphanProductDesignation/default.htm. Accessed 5 Apr 2018. FDA guidance for industry – designating an orphan product: drugs and biological products (updated: 02/16/2018). http://www.fda.gov/ForIndustry/DevelopingProductsforRareDiseasesConditions/HowtoapplyforOrphanProductDesignation/default.htm. Fast track, breakthrough therapy, accelerated approval, priority review. https://www.fda.gov/ForPatients/Approvals/Fast/default.htm. FDA CDER guidance for industry diabetes mellitus: developing drugs and therapeutic biologics for treatment and prevention (Feb. 2008). http://www.fda.gov/downloads/drugs/guidancecomplianceregulatoryinformation/guidances/ucm071624.pdf. Intercept announces phase 3 REVERSE trial evaluating OCA for the treatment of NASH patients with compensated cirrhosis, February 12, 2018. http://ir.interceptpharma.com/node/11576/pdf. Accessed 9 June 2018. Galmed Announces ARRIVE Study Data, February 14, 2018. http://galmedpharma.investorroom.com/2018-02-14-Galmed-Announces-ARRIVE-Study-Data. Accessed 9 June 2018. Akcea initiates phase 2 study of AKCEA-ANGPTL3-LRx in patients with hypertriglyceridemia, type 2 diabetes mellitus and nonalcoholic fatty liver disease (NAFLD), December 14, 2017. http://ir.ionispharma.com/news-releases/news-release-details/akcea-initiates-phase-2-study-akcea-angptl3-lrx-patients-0. Accessed 9 June 2018. FDA CDER guidance for industry developing products for weight management. http://www.fda.gov/downloads/Drugs/Guidances/ucm071612.pdf. Accessed 6 June 2014. FDA guideline for industry – the extent of population exposure to access clinical safety for drugs intended for long-term treatment of non-life-threatening conditions (ICH-E1A March 1995). http://www.fda.gov/downloads/Drugs/GuidanceComplianceRegulatoryInformation/Guidances/ucm073083.pdf. Accessed 6 June 2014. FDA guidance biosimilars (updated: 11/14/2017). http://www.fda.gov/Drugs/DevelopmentApproval Process/HowDrugsareDevelopedandApproved/Approval Applications/TherapeuticBiologicApplications/Biosimilars/default.htm. FDA guidance Electronic Common Technical Document (eCTD) (updated: 03/20/2018). http://www.fda.gov/drugs/developmentapprovalprocess/formssubmissionrequirements/electronicsubmissions/ucm153574.htm. FDA guidance – CDER data standards program (Updated: 03/30/2018). http://www.fda.gov/Drugs/Development ApprovalProcess/Forms SubmissionRequirements/ElectronicSubmissions/ucm249979.htm. FDA guidance for industry – oversight of clinical investigations — a risk-based approach to monitoring. http://www.fda.gov/downloads/drugs/guidancecomplianceregulatoryinformation/guidances/ucm269919.pdf. Accessed 10 June 2014. Svensson A. Sponsors viewpoint – the T2DM regulatory guidances and implications for drug development presentation at development of type 2 diabetes mellitus drugs: state-of-the-art cardiovascular safety assessments. October 5–6, 2010. L’Enfant Plaza Hotel, Washington, DC. http://www.diahome.org/Tools/Content.aspx?type=eopdf&file=%2fproductfiles%2f23808%2f10035%2Epdf. Division of Gastroenterology and Inborn Errors Products (DGIEP). https://www.fda.gov/AboutFDA/CentersOffices/Office ofMedicalProductsandTobacco/CDER/ucm252065.htm. Accessed 5 Apr 2018. The Fifth Liver Forum was held on November 10, 2016 in Boston, MA. http://www.hivforum.org/projects/liver-forum/liver-forum-meetings/1358-liver-forum-5. Regulatory considerations Lara Dimick-Santos, U.S. Food and Drug Administration. http://www.hivforum.org/storage/documents/2016/LF5/02_Dimick-Santos.pdf. Accessed 5 Apr 2018. Guidance for industry expedited programs for serious conditions – drugs and biologics. https://www.fda.gov/downloads/drugs/guidancecomplianceregulatoryinformation/guidances/ucm358301.pdf. Accessed 5 Apr 2018. MELD score for end-stage liver disease. http://reference.medscape.com/calculator/meld-score-end-stage-liver-disease?src=ppc_google_rsla_ref&gclid=CIuS-9LV-9ACFRZMDQodOCQGMA. Accessed 5 Apr 2018. Brunt EM. Nonalcoholic fatty liver disease: pros and cons of histologic systems of evaluation. Lonardo A, Targher G, editors. Int J Mol Sci. 2016;17(1):97. https://doi.org/10.3390/ijms17010097. FDA’s plan to engage the public in the agency’s new effort to strengthen and modernize FDA’s regulatory framework. https://blogs.fda.gov/fdavoice/index.php/2017/09/fdas-plan-to-engage-the-public-in-the-agencys-new-effort-to-strengthen-and-modernize-fdas-regulatory-framework/. Accessed 5 Apr 2018. Guidance for industry: providing clinical evidence of effectiveness for human drug and biological products. https://www.fda.gov/downloads/Drugs/GuidanceComplianceRegulatoryInformation/Guidances/UCM072008.pdf. Accessed 5 Apr 2018. Randomized global phase 3 study to evaluate the impact on NASH with fibrosis of obeticholic acid treatment (REGENERATE). https://clinicaltrials.gov/ct2/show/NCT02548351. Accessed 15 Apr 2019. 510 (k) Summary Apr 5 2013 Echosens’ FibroScan® System https://www.accessdata.fda.gov/cdrh_docs/pdf12/K123806.pdf. Accessed 5 Apr 2018. Guidance for industry: FDA staff qualification process for drug development tools https://www.fda.gov/downloads/Drugs/Guidance Compliance RegulatoryInformation/Guidances/UCM230597.pdf. Accessed 5 Apr 2018. Guidance for industry: patient-reported outcome measures: use in medical product development to support labeling claims. https://www.fda.gov/downloads/drugs/guidances/ucm193282.pdf. Accessed 5 Apr 2018. Sanyal A. Endpoints and clinical trial design for nonalcoholic steatohepattis NIH. Hepatology. 2011;54(1):344–53. https://doi.org/10.1002/hep.24376. https://www.ncbi.nlm.nih.gov/pmc/articles/PMC4014460/pdf/nihms289374.pdf. Guidance for industry: codevelopment of two or more new investigational drugs for use in combination. https://www.fda.gov/downloads/drugs/guidances/ucm236669.pdf. Assessed 5 Apr 2018. 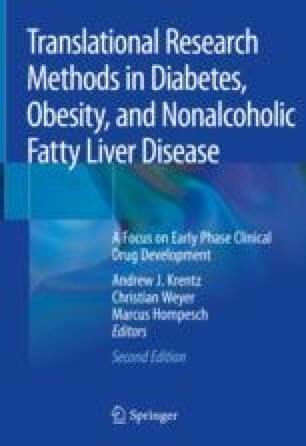 Li Y, Liu L, Wang B, Wang J, Chen D. Metformin in nonalcoholic fatty liver disease: a systematic review and meta-analysis. Biomed Rep. 2013;1(1):57–64. https://doi.org/10.3892/br.2012.18. The voice of the patient: a series of reports from FDA’s patient-focused drug development initiative (Mar. 2018). https://www.fda.gov/ForIndustry/UserFees/PrescriptionDrugUserFee/ucm368342.htm. Public workshop on patient-focused drug development: guidance 1 – collecting comprehensive and representative input. https://www.fda.gov/Drugs/NewsEvents/ucm574725.htm. Patient-focused drug development: disease area meetings held in fiscal years 2013–2017. https://www.fda.gov/ForIndustry/UserFees/PrescriptionDrugUserFee/ucm347317.htm.